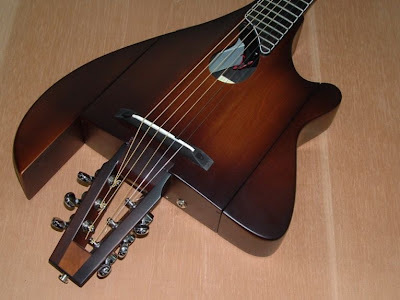 Vergilio Lima Luthier English: Eletric "Proteus"
This instrument was thought for those who need to travel and don´t want to risk their expensive acoustic guitar on air transport. 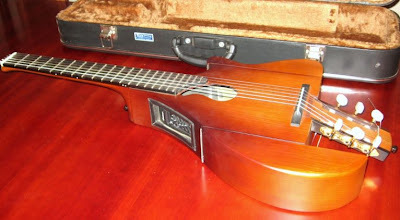 This is a "folding" guitar that once fitted on it´s case has just a violin size. It can be taken in the airplanes as hand baggage. When unfolded it shows guitar´s normal dimensions and specially keeping the same body contact points with leg, right arm elbow and chest. 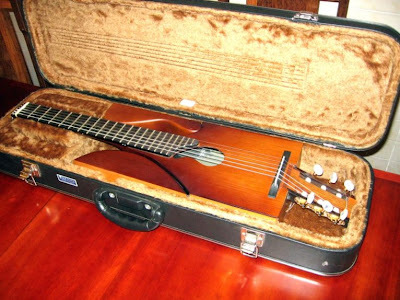 It doesn´t give you that "emptiness sensation" some compact guitars may give. 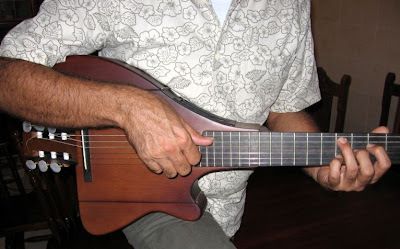 Neck, action and pick-up were studied to keep feeling and sound as close as possible to acoustic guitars. Classical or steel guitar neck available. *Proteus was a greek god that could change its form as wanted.